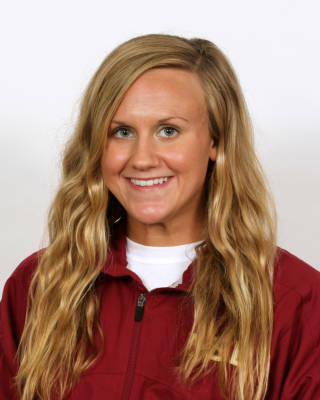 Served the 2012-2013 season as a team captain…earned second swims at the ACC Championships in the 50 free and 100 free…Set her career-best of 23.62 in the 50 free and 50.83 in the 100 free at the ACC Championships…was also elected as the SAAC president…won the Strength and Conditioning award and Coaches’ Award at the end of the year awards banquet. Took fifth in the 100 free with the 51.30 and tenth in the 100 fly with a 55.98 at the Bulldog Invite…added another season best time at the Bulldog Invite in the 50 free at 23.75…will serve as the team captain for the 2012-13 season…was elected president of SAAC for the 2012-13 school year. Placed eighth in the 50 free (23.99), 11th in the 100 free (51.96), 13th in the 100 fly (57.21) and 17th in the 200 free (1:53.61) at the Senior Champs meet… during the Clemson meet finished second in the 100 free (53.35) and fifth in the 50 free (24.64)…Helped in the upset of Florida by finishing fifth in the 100 free (51.67)…At the Georgia Tech Invitational posted finishes of 15th in the 100 free (51.13), 17th in the 50 free (23.77), and 23rd in the 200 free (1:52.12)…Took second in the 100 free (52.83) versus Nova Southeastern…Brought home a second place finish in the 100 free (53.52) during the dual sweep of Florida Atlantic and Florida International…At the All-Florida Invitational posted finishes of 15th in the 100 free (53.48), 18th in the 50 free (24.77), and 27th in the 200 free (1:58.05). 18 time Mississippi high school state champion… holds 35 Mississippi state records in individual and relay events… broke the Mississippi high school state record in the 100 free as a senior… competed at the NCSA Junior Short Course Nationals… all-state in the pole vault as a junior… six-time Rotary Scholar… two-time Scholastic All-American… ACT Scholar… made the academic honor roll all four years of high school. Born October 29, 1991… majoring in Public Relations with minors in Psychology and Business… president of the Shakespearean Literary Society, Teenage Republicans and Future Business Leaders of America… daughter of Scott and Renee Wilson.